A few months ago, I booked a Christmas Shopping trip to Dublin, Ireland, for me and my boyfriend. I thought it would be fun to have something to look forward to in the dark days before Christmas. I imagined it would be great to go to Dublin in December. It would be nice to shop for Christmas gifts and sure there would be some nice Christmas Markets in Dublin to wander around at? Right? When I booked the Dublin December trip, I thought I could use it to write about Christmas Markets in Dublin. How you do not have to go to Germany to visit some nice Christmas Markets and you would equally get into the Christmas spirit in Dublin. You can read my how to plan your Christmas market trip here. Boy was I wrong! 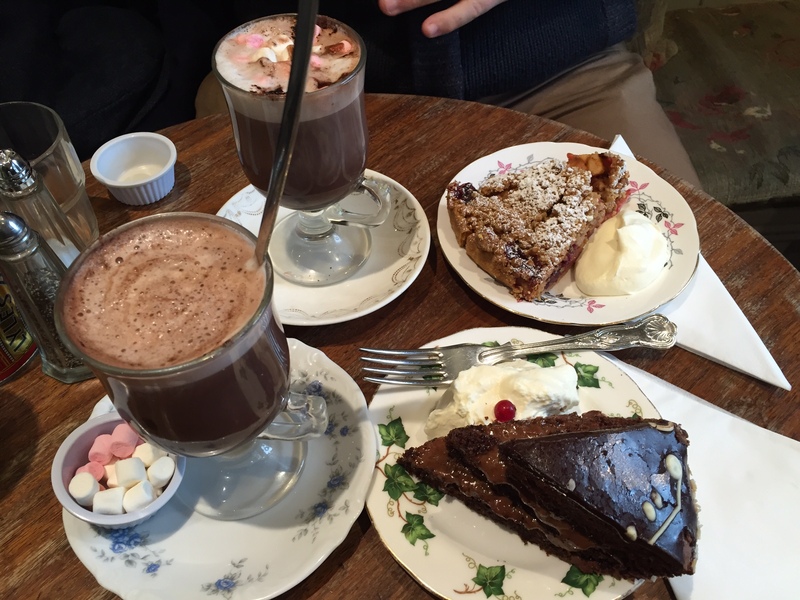 Dublin has so much to offer, but if you’re looking to browse Christmas Markets in search of handmade ornaments, hand embroidered table cloths or some mulled wine under the Christmas tree, Dublin is certainly not the place to go. We spend 4,5 days in Ireland’s capital and only went to THE Dublin Christmas market for 5 minutes. It was a sad collection of tents, far away from the shopping area. There were hardly any people in sight and no atmosphere what so ever. The Dublin Christmas Market, is called “I believe in Christmas”. It was located at CHQ Building. This is located away from the main shopping areas and I believe (ha! get it?) that’s one of the main problems. It’s not very busy and that gives the place a dark, cold atmosphere. All places to sit, stand or talk are wet and windy. The floor is slippery, there is no music and the booth holders are not very interested either. No, this was definitely not the Christmas market I had envisioned when I wanted to go to Dublin in December. What a disappointment. But, I was not disappointed for long, because Dublin is an amazing city and we had so much fun while we were there. Dublin has changed their Christmas festivities plan and the “I believe in Christmas market” in Dublin is no more. Winter festivities in Dublin begin from November 2018 and you can expect many magic Christmas lights and various Christmas shopping opportunities. We didn´t spend much time on the sad Christmas market, because we instantly had 500 other and better ideas where we could spend the evening. Even though the Christmas market kind of sucked, Dublin was still a great Christmas trip. Even in December, when it gets dark quickly and the days can be cold, exploring the city was wonderful. Everywhere you look, Christmas lights are twinkling. There are so many shopping opportunities and there are also so many other things to do when you go to Ireland in December. Trinity College is a must see place when you visit Dublin. The College is situated right in the centre of town and has a major top attraction: the Trinity Library and the Book of Kells. This ancient book is said to have been written in the 7th century. 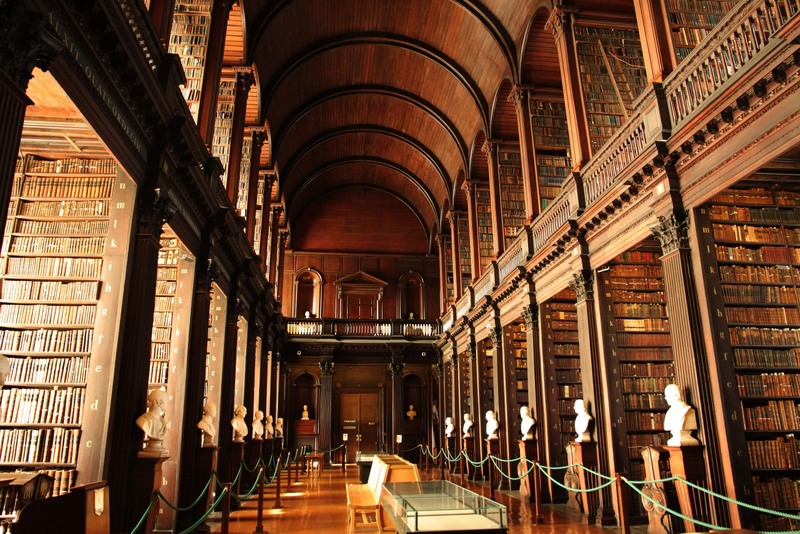 The Trinity Library is included in your ticket to visit the book of Kells. I love libraries and bookstores. The atmosphere in these places is one of old stories and forgotten tales. Get your fast-track ticket for the Book of Kells here. The Trinity Library is really the master of old places. 2 stories high, this place is packed to the brim with books. The light flows in from the high windows and all the books are sitting there, waiting to be explored by some scholars. That´s right, if you study at Trinity College and you would need to look up anything, you can request to read one of those ancient books. It really is a remarkable place. During December, the College is not very busy and you have plenty of time to wander around and nobody will get in your way. If you’re looking for more things to do as a bookworm in Dublin, the post by Eternal Arrival got you covered. Don’t forget to snap a picture with the great Sphere within Sphere artwork. We´ve booked tickets to the Guinness Storehouse because it sounds like a fun idea. 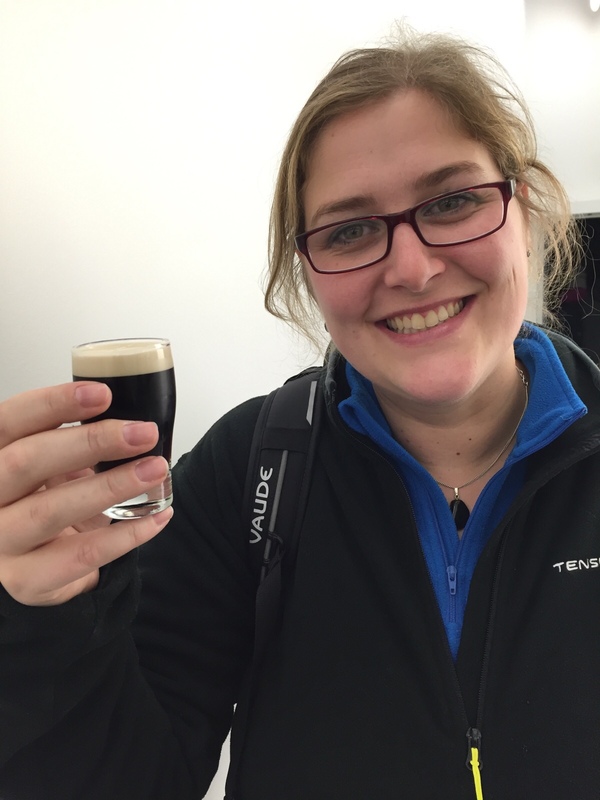 A tour around the Guinness brewery and a pint of Guinness in the end. It wasn´t anything like I imagined up front. The Guinness Storehouse is more a fun, interactive stroll around history and a museum of experiences. The Guinness Storehouse is built as a pint of Guinness. You´ll start at the bottom and work your way up to the top where you´ll be rewarded with a complementary pint of Guinness. Get your Priority Entrance Ticket for the Guinness Storehouse + free Pint. In the meantime, you´ll learn about the ingredients and the history. Beer making in the old days, the transportation of Guinness, the marketing and all the other things involved in this brand. You need to get in line to experience the tasting room, where you can smell all the separate ingredients of the beer and you get a small tasting glass of Guinness. They even teach you the proper way to taste your Guinness. After this, you´ll move up a floor, where you can get a certificate for pouring your own Guinness. That´s right, you can get behind the tap and poor your own pint! To top things off, you´ll move up to the top of the building, where the sky bar gives you 360 degrees round views of Dublin and its surroundings. A great back drop to down your pint of Guinness. Read more: How to give travel as a Christmas Gift. 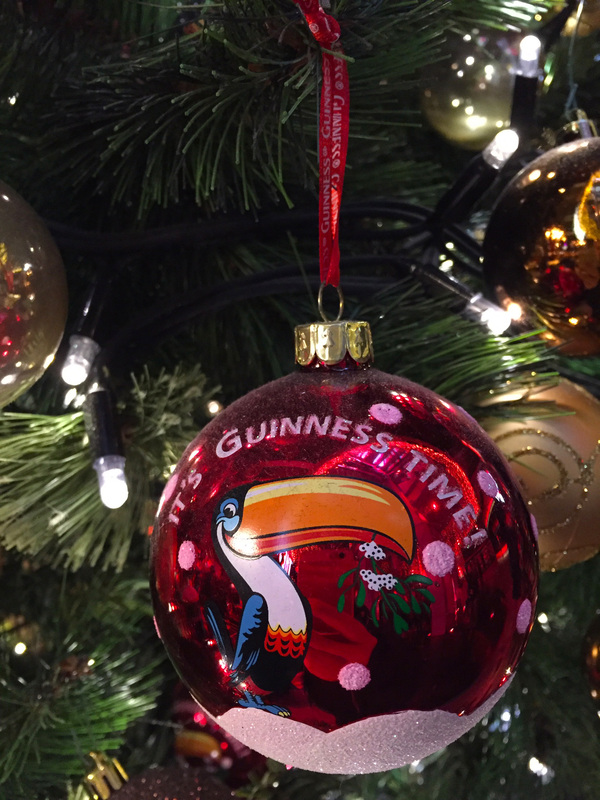 In December, the Guinness Storehouse is decorated with a million Christmas lights and you can shop for some great Guinness Christmas baubles. When it gets rainy outside, the Guinness Storehouse is a great place to explore. Because it get’s dark early in December, you’ll have amazing views of the lights of Dublin at the Sky bar. 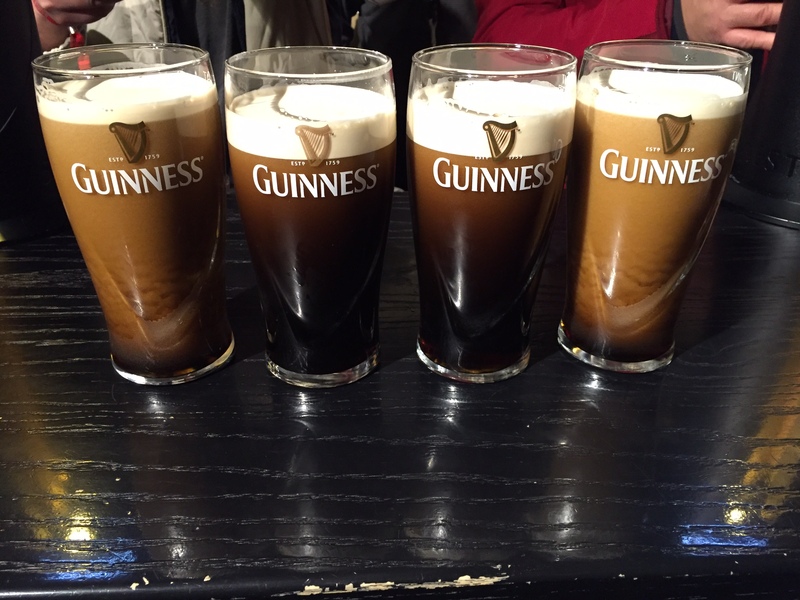 Have you been to the Guinness Storehouse? What was your favorite part? Buy your Guinness Storehouse Ticket (including a free pint!) here. Looking for a place to stay? Check Dublin Hotels in December. I love churches although I´m not religious. The scale of most of these places and the history that surrounds them, have a deep impact on me. And not to forget: they are masterpieces of engineering. Saint Patrick’s Cathedral was no exception. We jumped off one of the buses and hurried inside, because it was raining. Therefore, we did not see much of the outside, but the interior was really astonishing. The atmosphere was calm and although it was much darker that Christ Church Cathedral, the light in St. Patrick’s was soft and put the altar in the spotlight. 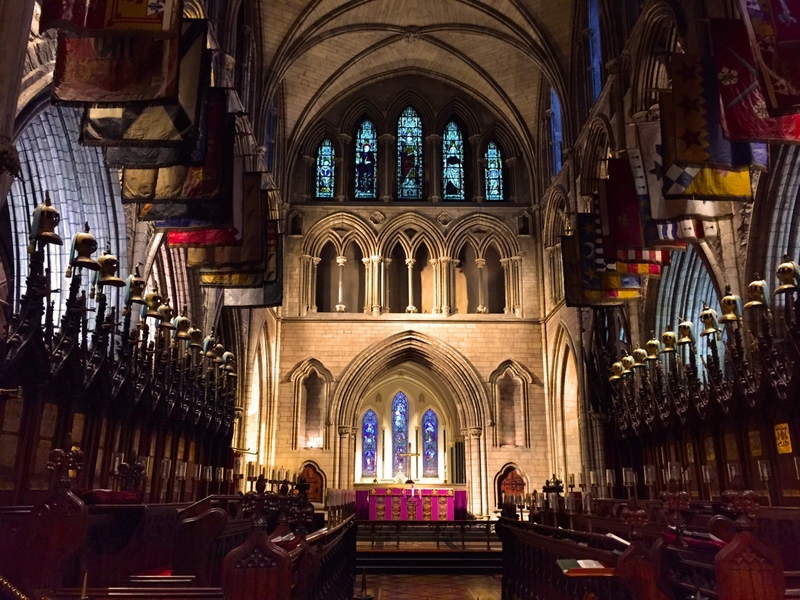 Read more about the history of St. Patrick’s Cathedral. The choir was truly beautiful with the banners and swords above the seats. Make sure to take your time to check out the videos that are playing, as they offer a great view of the history of the cathedral. If you say Dublin, you say pubs. On every street corner you can find at least one and they are open basically all day. They also serve food all day and ordering a pint of Guinness at 11 am is not a weird thing. We spent every night in a pub. We had a quiet night at a heritage pub were we ordered stew and had our first pints of Guinness. On another night, we hung around a pub with live music and Irish folklore dance. It was a bit noisy but definitely something we wouldn’t have wanted to miss. Another night we ate at a very busy pub with all kinds of different people drinking and talking, while we had dinner at 9 pm. And on Sunday, we spend some time in a family pub, with children running around and old couples going out for a drink. Every time, we were more than welcome. They could always find us one more table to sit at and the atmosphere was very relaxed. With the Dublin weather in December, it’s always a good excuse to get out of the rain and into the pub! Looking to meet people and enjoy publife? Consider a Pub Crawl in Dublin. 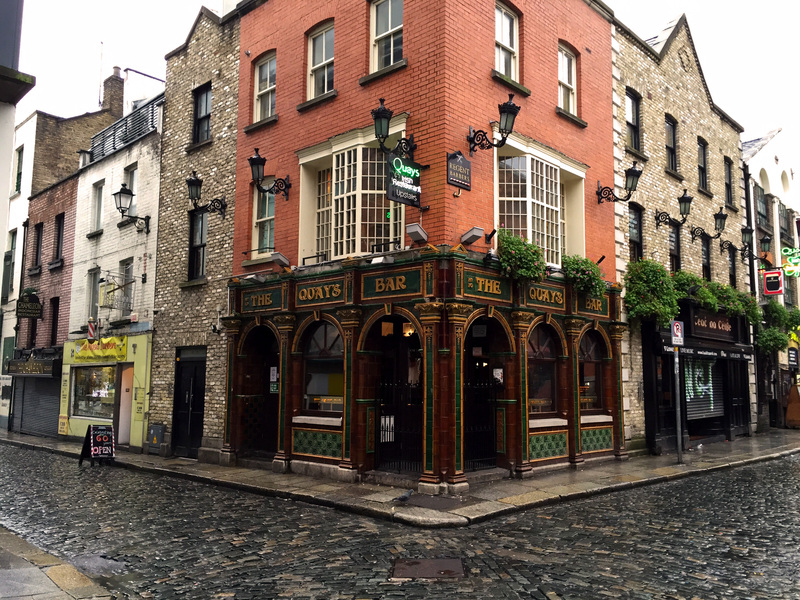 Here are some other gorgeous photographs of Dublin’s pubs by Jim of nomadicpursuits.com. Make sure to check it out to get in the mood. I’ve travelled to many places. Close to home and to the other end of the world. Most of the time I felt like a tourist. Sometimes I felt like a walking ATM where local people could squeeze a quick buck out of me. Every single person we’ve encounter, whether it was the lady at Tesco’s or the waitress in the pub or the bus driver, was super friendly. Every single one of them was very kind, interested and welcoming. A man on the street had no problem pointing us in the right direction and adding his local point of interest of the city. A lady went out of her way during her lunch break to give us directions to the “Queen of tarts” one of the best cake shops in town. I think it’s safe to say, the people of Dublin make you feel welcome and partly responsible for the great vibe that goes around town. So, no, if you wish to visit Christmas Markets, Dublin is not the best place to go. But if you like to go Christmas shopping, Dublin is a good spot. The shops are open until late, all shops are festively decorated and you’ll have no problem finding a (ugly) Christmas sweater or t-shirt. Looking for more things to do in Ireland in Winter? Looking to explore more of Dublin and Ireland? Consider a day trip from Dublin. Here are some great recommendations. If you’re sick of shopping, there are loads of other things of interest to see and do around Dublin. I’m sure you’ll have a good time when you go to Dublin in December. I know I had a great time! Check my round up of the costs of our time in Dublin. Here’s a map of Dublin with the above mentioned sites. As meeting people and going to a pub can be done all over Dublin, these cannot be pin pointed to a specific place on the map. How to get to Dublin? Which airlines doesn’t fly to Dublin? Dublin is the hub for Aerlingus and Rynair, but numerous other airlines fly from Europe but also inter-continental to Dublin Airport. Find your flight to Dublin via a site like Skyscanner. Once landed at Dublin airport, you can take the Airlink bus to the city, which is easy and relatively cheap. Where to stay in Dublin in winter? Because we stayed in Dublin for almost 5 days, I decided to rent an AirBnB just of O’Connell Street. If you’d like to be a little bit more central and have a tight budget, you can consider Barnacles Temple Bar House. That is right, bring your earplug as this hostel is right in the centre of Dublin’s famous night life scene. Dorms start at €21 but they also provide twin and double rooms. If you’re looking for more hostels? Check this backpacker accommodation guide for Dublin. If your budget is a little bit higher and/or you value your night’s rest more, consider staying at Kingfisher Townhouse. Boutique style twin and double rooms on a quiet location, but still centrally located in Dublin. Prices from €85 for a double, but check for prices and availability. If you want to make your stay in Dublin a true luxurious winter fest, then consider to splurge- BIG time! Dublin is home to some of the most classy, upscale and historical hotels and dishing out for a holiday suite might be the perfect way to celebrate Christmas in Dublin. Close to St. Stephan’s Green, I’d choose the Shelbourne Dublin Hotel as it is the perfect base to explore Dublin in winter and go Christmas Shopping. Read more: Festive hotels to celebrate Christmas in Europe. Ireland has the Euro (€). This makes it easier to travel to Dublin on a short weekend trip from Europe as you do not need to exchange any money. Coming from outside of Europe, this obviously doesn’t apply. It is easy to pay with cash, debit and credit cards. The price level is compared to other big touristic cities in Europe. I found transport and activities quite expensive, but the food and drinks at the pub were lower to what I’m used to. Read more about what we spend on our trip to Dublin in December. Yea, winter in Europe. It is a bit of thing. Ireland is known for their rainy and stormy weather and we experienced quite a fair bit of that during our visit in December. The sun rises around 8am but sunset is around 4 to 5 pm. In November, the streets are not as brightly decorated and January and February can seem greyer and colder. December is the perfect time to visit Dublin. Just bring a good winter coat, a warm hat and an umbrella and you’ll be fine. We had rain, hail but also bright blue skies and sun shine. There is always a pub nearby providing shelter and warmth. Have you been to Dublin? Or are you planning a trip to go to Dublin in December? Please share your thought below. This post contains affiliate links. If you decide to purchase anything through my link I will earn a small commission at no extra cost for you. How to plan your Christmas Market trip? How to give a holiday as a Christmas gift? I am going with my family the first week in new year. Will it still be like you described. Well lit due to Christmas and enjoyable? I hope so. Any recommended places to stay? I will be going with family of 4 and two kids as well. We want to situate ourselves in Dublin and then maybe take day trips to the cliffs etc. do you think that’s advisable? I sent you an e-mail Sonu. I figured that would be easier. I will be going to Dublin with my partner this December 2017! Im looking forward to a great time! Thank you for sharing the article! That is great Silvia! I’m sure you’ll have a great time! My husband and I went in December last year to Dublin and I couldn’t agree more with this post. No Christmas market to speak of however, Grafton Street looks spectacular all decorated up. Dublin is wonderful in December!! For one of our day trips, because we really wanted a “Christmas Market”, we took the train up to Belfast in Northern Ireland. They had a huge Christmas market that was a lot of fun to see and we combined it with morning visit to the Titanic Museum/Exhibit. All very doable in one day. I have been wanting to go to Dublin, but I was waiting for the Spring. Maybe I should go there next month instead. I am trying to plan a getaway for my birthday. I am currently living in Berlin, Germany. Thank you for all the recommendations. Great post! It looks great! I am ashamed to say, even though I spent the first 20ish years of my life living in the UK, I never made it across to Dublin – I think that sometimes you get a bit complacent with what is on your doorstep! Sorry to hear that the Christmas Market wasn’t great, I went to the one in Belfast and loved it! Though sometimes they can be extremely overcrowded, Glad you enjoyed your time in Dublin! Dublin is good during Christmas I should have go there. thanks for this!